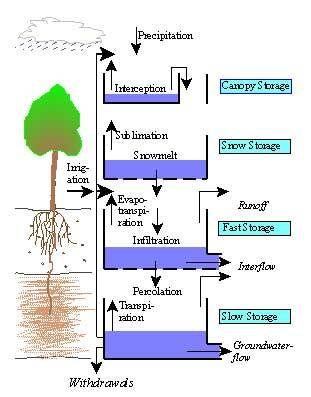 SLURP (Semi-distributed Land Use-based Runoff Processes), is a basin model which simulates the hydrological cycle from precipitation to runoff including the effects of reservoirs, dams, regulators, water extractions and irrigation schemes that has been referred to in more than 25 papers in international journals by different authors. The model may be used to examine the effects of proposed changes in water management within a basin or to see what effects external factors such as climate change or changing land cover might have on various water users. The model may use locally-available climate data or may be run using only public-domain data sets available on the internet. Satellite images may be used in the model for land cover mapping, vegetation indices (for leaf area index and for evapotranspiration calculations), cloud cover (to distribute precipitation), snow extent and snow water equivalent. The model is supplied with a 200-page manual in pdf format and sample data sets on a CD-ROM. The model makes full use of Windows capabilities with graphical data inputs and graphical displays of outputs. These include the daily components of the hydrological cycle and generated runoff. The model initially divides a basin into hydrological sub-basins and then divides each sub-basin into its component land covers using public-domain topographic analysis software (Figure 1). The model then simulates the vertical water balance at each element of the sub-basin/land cover matrix using daily climate data (Figure 2). The climate data may be obtained from ground stations, from the outputs of global circulation models or numerical weather prediction models or from on-line datasets such as the GSOD global climate data or the IWMI World Water and Climate Atlas. Runoffs from each matrix element are then routed through each sub-basin to the basin outlet taking account of reservoir regulation, diversions, groundwater extractions and water exports from the basin. Figure 2. SLURP vertical water balance. 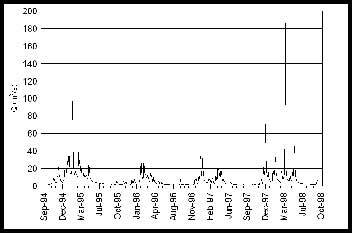 Both time series (e.g. 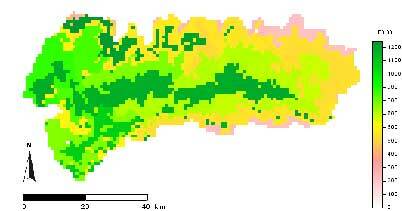 Figure 3 for river flows) and areally-distributed data (e.g. Figure 4 for basin-wide transpiration) are produced by the model for unlimited time periods and unlimited size of basin. Figure 3. Daily simulated hydrograph, m3/s, Küçük Menderes River at the outlet. The latest version of SLURP incorporates the TOPAZ and SLURPAZ topographic analysis programs (written by the USGS/University of Saskatchewan). This system derives the topographic and land cover information needed by SLURP in a form that can be directly used and represents a major saving in time and effort when compared to using a GIS. SLURP allows the use of both surface water and groundwater for furrow or sprinkler irrigation as well as river and groundwater extractions for urban or industrial use at any part of the basin. Because SLURP is a distributed model, it can produce maps of basin-wide crop transpiration, soil evaporation and net runoff for use in performance evaluations of irrigation schemes or to investigate water availability. Figure 4. Total transpiration, mm, Küçük Menderes Basin, 1995. The effects of changes in atmospheric CO2 on plant water use efficiency may be included when evaluating the effects of climate change scenarios on water resources and on the various water users. Similarly, the areas of different land covers may be changed any time during a model run to allow investigation of the effects on water resources of changing both land cover and climate over time. Applications of SLURP have been published for basins varying in size from prairie sloughs measured in a few hectares (Su et al., 1997) through small basins of the order of 250 square kilometers (Sabourin & Associates, 1996) and basins in the range of 7,500 - 35,000 km2 (Kite, 1993) to a macroscale basin of 1.8 million square kilometers (Kite et al., 1994). Uses have included investigation of the effects of possible climate change on rivers flowing to the Arctic Ocean (Kite et al., 1994), studies of hydro power production in the Columbia River (Kite, 1997), in India (Jain et al., 1998) and in Turkey (Sorman and Uzunoglu, 1998), an evaluation of irrigation schemes in the context of basin water resources (Kite and Droogers, 1999), an estimation of irrigation performance statistics (Droogers, P. and G.W.Kite, 1999) and to investigate fisheries in the Mekong River (Kite, 2000). Droogers, P. and G.W.Kite, 1999. Water productivity from integrated basin modelling. Irrigation and Drainage Systems, 13, 275-290. Jain, S.K., N. Kumar, T. Ahmed and G.W. Kite, 1998. SLURP model and GIS for estimation of runoff in a part of Satluj catchment, India. Hydrological Sciences Journal, 43(6), 875-884. Kite, G.W., 1997. Simulating Columbia River flows with data from regional-scale climate models. Water Resources Research, 33(6), 1275-1285. Kite, G.W., 2000. Modeling the Mekong River. IWMI Working Paper, IWMI, PO Box 2075, Colombo, Sri Lanka. Kite, G.W., A. Dalton, and K. Dion, 1994. Simulation of streamflow in a macro-scale watershed using GCM data. Water Resources Research, 30(5):1546-1559. Kite, G.W. and P. Droogers, 1999. 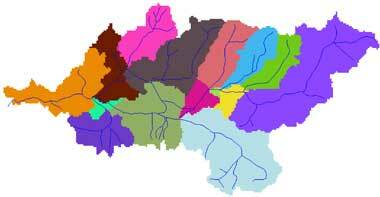 Irrigation modelling in the context of basin water resources. J. Water Resources Development , 15, 1/2, 43-54. Sabourin, J.F. & Associates, 1996. Implementation of a distributed hydrologic model: Using SLURP on the Carp watershed. CCRS, Ottawa., 43pp. Sorman, A.U. and E. Uzunoglu, 1998. Application of the SLURP model in snowmelt runoff predictions in eastern Turkey. Proc. Fourth International Workshop on Applications of Remote Sensing in Hydrology, Santa Fe, November, 1998, NHRI, Saskatoon, Canada. Su, M., W.J. Stolte and G. van der Kamp, 1997. Modelling wetland hydrology using SLURP. Proc.Scientific Meeting of the Canadian Geophysical Union, Banff, Alberta, p. 198. © Copyright 2018. Water Resource Publications, LLC. All rights reserved.